Greek Prime Minister Alexis Tsipras said in a speech to parliament on Friday that his country cannot accept the “unrealistic” proposals set by its lenders that did not include a promise of debt relief. "The proposals submitted by lenders are unrealistic, the Greek government cannot consent to absurd proposals," he said. Greece’s Troika creditors have been doing their best to not include debt relief in their negotiations with Athens. Tsipras also said that Greece will not sign up to new bailout when the current one expires in June. Greece’s international creditors have said they want VAT reform, fewer tax rebates, pension cuts, a smaller civil service and more private sector investment. But Tsipras has ruled out increasing VAT on energy and reducing supplementary payments for poorer pensioners. Athens is also demanding lower primary budget surplus targets. Creditors wanted these to be 1 percent of GDP this year and 2 percent next, while Greece has proposed 0.8 percent this year and 1.5 percent for 2016. However, he insisted that Greece is closer than at any time at securing a deal with the Troika, which includes the IMF, the ECB and the European Commission. 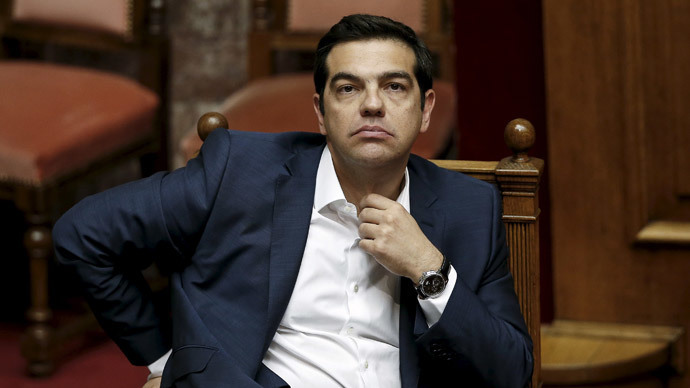 Tsipras’ uncompromising speech comes just hours after Greece delayed making a €300 million payment to the IMF and said it will instead pay it with three other payments at the end of June amounting to €1.6 billion. Athens is trying to hammer out a deal with creditors for €7.2 billion in funds while at the same time avoiding further austerity measures, which many Greeks believe have crippled the economy and driven much of the population into destitution and poverty. It was also announced Friday that Tsipras will meet Russian President Vladimir Putin in two weeks at the St Petersburg International Economic Forum. There has been speculation that Russia might bail Greece out of its financial difficulties, but Russia has denied this instead saying that it would not directly aid Athens but would help through investment projects. One such project is the Turkish Stream gas pipeline that, when complete, will transport 47 billion cubic meters of gas to the Turkish Greek border.